Water is vital for proliferation of life. It is essential for social and health well-being of all living organisms. Chemical maintenance of water is a complicated balancing act of maintaining sufficient disinfectants and appropriate pH levels to prevent harmful bacterial growth, protect equipment corrosion, or scaling whilst retaining pleasant taste, smell, and texture. Chemical properties of water vary during storage or propagation through pipes (or other media of transportation); thus, its quality is to be tested, adjusted, and verified on a regular basis. Today, the most reliable method of water testing and verification relies on laboratory testing of samples taken from the water source. The procedure often entails obtaining and transferring samples from the site to the testing facility every few hours, followed by testing and analysis of the results. The results are generally accurate, but the entire sampling and analysis procedure is extremely costly and time consuming. Furthermore, verified results are not always reliable indicators of presently available water as they are acquired from a ‘sample’ taken hours before. This delay is especially of concern when the results indicate undesirable chemical properties and need for immediate treatment. An alternative and widely practised approach to water quality verification relies on use of paper test trips, a method in which tests can be performed onsite without the requirement of laboratory facility or technical skills. Paper test strips are an especially common use in the Pool and Spa industry for their ease of use and fast response time; however, the results are proved to be inaccurate, limited (only certain chemical properties can be verified), and, in a variety of applications, unreliable. 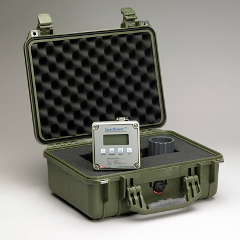 Weir-Jones’ proprietary solution to water quality verification addresses all the aforementioned issues and eliminates the hassle of traditional complicated inaccurate test kits. It can be employed at the water source, at the consumer end, or any location in between; it provides monitoring and recording features accessible onsite or through a wireless network with minimum effort.